[Note added 2018-10-19] Todd Bol, the founder of the Lit­tle Free Library move­ment, died this week of pan­cre­at­ic can­cer at his home in Wis­con­sin. He was 62. Here is the Star Trib’s obit­u­ary. Min­nesotans love their books, and the Lit­tle Free Library phe­nom­e­non is one proof of it. Pic­ture a hand-craft­ed, glass-front­ed, minia­ture house on a post in your front yard. It’s filled with books. A sign invites vis­i­tors to take one for free or to leave one. The move­ment start­ed in 2009 in Hud­son, Wis­con­sin. 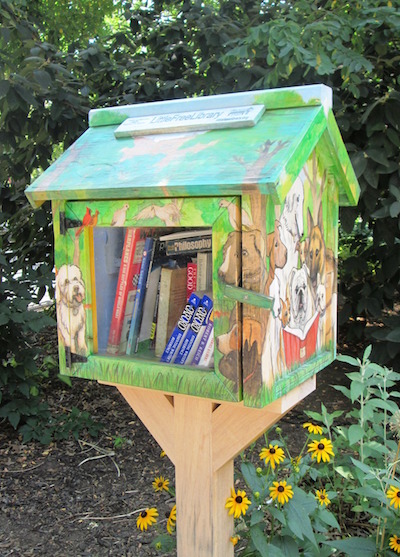 Lit­tle Free Library is now a 501-C(3) non-prof­it cor­po­ra­tion based there. Matt Bol birthed the idea when he put up the first LFL out­side his home to hon­or his deceased moth­er, who had been a teacher and a life­long lover of books. Bol and co-founder Rick Brooks start­ed hand-build­ing LFLs and giv­ing them away. As a move­ment began to gath­er around them, it became appar­ent that that approach would not scale, so they formed a tax-exempt char­i­ta­ble orga­ni­za­tion and began charg­ing for LFL kits and pre-built Libraries. The prod­uct cat­a­log now offers 21 dif­fer­ent designs going for $150 to $600, with­out posts or mount­ing hard­ware. Two one-of-a-kind designs are list­ed for $1,500 and $1,000,000. The for­mer is cov­ered in stained glass; the lat­ter has draw­ings by Simp­sons cre­ator Matt Groen­ing and comes hand-deliv­ered by Matt Bol, who will take you out to din­ner into the bar­gain. Andrew Carnegie built 2,509 libraries between 1883 and 1929. The orig­i­nal goal of the LFL founders was to put up more LFLs than that. Once the move­ment got rolling the founders guessed they would achieve that num­ber by 2014, but the mile­stone was passed in 2012. The orga­ni­za­tion reports that as of last month more than 30,000 libraries had been reg­is­tered in 50 states and 70 coun­tries. LFL has sim­i­lar­i­ties to the open source move­ment in tech­nol­o­gy — it encour­ages oth­ers to spread the meme wide­ly, for the enhance­ment of both lit­er­a­cy and com­mu­ni­ty. For this rea­son the offi­cial count of LFLs under­es­ti­mates the phenomenon's scope. For exam­ple, this Seat­tle-area crafts­man, a retired home remod­el­er, makes his liv­ing design­ing and build­ing “mini libraries.” His designs range from $250 to $800. His web­site doesn’t men­tion the LFL move­ment or orga­ni­za­tion. You may have read about the Lit­tle Free Library sen­sa­tion before. At this point press out­lets are pick­ing up the sto­ry 10 or 20 times every week. A local jour­nal­ist pub­lished a book on the top­ic. Mass­a­chu­setts is home to a total of 82 LFLs, accord­ing to this offi­cial list from July. (Note: that link will down­load a 7.2-MB PDF.) In the area local to Gro­ton, MA, three are list­ed in West­ford and one each in Chelms­ford, Low­ell, and Leomin­ster. Minneso­ta, with a pop­u­la­tion about 20% small­er than that of Mass­a­chu­setts, has ten times the num­ber of LFLs: 821 in all. St. Paul hosts 121 of those, or about one in sev­en, far out­strip­ping the city’s pro­por­tion of the state pop­u­la­tion, which is one in twen­ty. Of the Lit­tle Free Libraries in St. Paul, 21 are locat­ed in four super-blocks (pic­tured) in the Macalester-Grov­e­land neigh­bor­hood, a rough square 1.2 miles on a side. I’m sure the den­si­ty of uni­ver­si­ties in the area has every­thing to do with Mac-Groveland’s fond­ness for the LFL. That, and the walk­a­bil­i­ty of this neigh­bor­hood. I think you could prob­a­bly dou­ble the num­ber you've count­ed in the "super blocks" here in Mac-Grov­e­land — I live on Berke­ley, and between Snelling and Fairview I know there are at least three, but only one is marked. I'm sure not every­one reports their LFL to the offi­cial web­site. But no mat­ter how many, or how fan­cy, or how big, I'm sure every block could use a cou­ple more. This is one of the best ideas to come around in a long time! Thanks for the sto­ry — it's real­ly some­thing we can be proud of here in our neigh­bor­hood. Thank you, Sher­ri. If the actu­al num­ber were dou­ble, that would sur­prise me great­ly. We drove every street in that 2.44-sq.mi.area, not­ing loca­tions of all vis­i­ble LFLs. We might well have have missed a few. If you send me loca­tions (an email link is on the About page) I will update the map. I didn't rely on the offi­cial map host­ed on the LFL site. For the reg­is­tered Libraries to be includ­ed on that map, the care­tak­er has to take one addi­tion­al step. I expect that few know that — the cura­tor of my near­est neigh­bor­ing LFL didn't when I asked her. The offi­cial LFL map shows only five in that four-square-super-block area in which I count­ed twen­ty-one. I live in Berke­ley, CA and walk in many neigh­bor­hoods. I've seen many of these lit­tle libraries. Nice to have the his­to­ry. Next time I notice one, I'll check to see its pedi­gree. Hi Kende­lyn, thanks for the report from the Far Left Coast. I last lived in Berke­ley in 1976, and vis­it­ed a num­ber of times on busi­ness over the fol­low­ing two decades. Now that I think about it, Berke­ley is a city as walk­a­ble as St. Paul: Every street has side­walks on both sides, even the small­er twisty streets way up into the hills. Per­fect for LFLs.